A catamaran sailing boat anchors in the Bay of Islands in New Zealand ready to take passengers on another exciting adventure. Under the fluffy white clouds with blue patches of sky peeking through over the Bay of Islands on the North Island of New Zealand, the Carino, a 50 foot sailing boat drops anchor. Daily trips are made on this catamaran where visitors to New Zealand can come aboard and venture out around the Bay of Islands to search for the bottlenose dolphins.The crew aboard this catamaran make every boat excursion enjoyable as they are extremely knowledgeable about the surrounding waters of the Bay of Islands as well as the wildlife. A trip aboard the Carino catamaran while visiting the North Island of New Zealand is a day well spent as you view the coastline of the North Island from the water.Carino, a 50 foot catamaran sailing boat, anchored at Motuarohia (Roberton) Island in the Bay of Islands, Northland, East Coast, North Island, New Zealand. 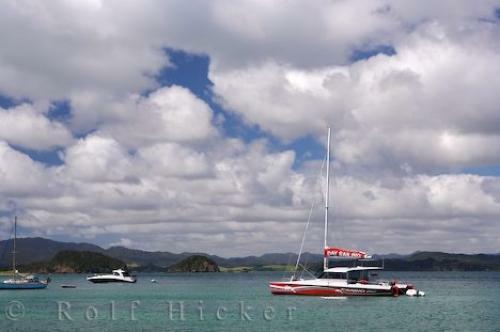 Photo of the Carino, a catamaran sailing boat anchored in the Bay of Islands in Northland, New Zealand.